Pamucak Beach is situated on the Aegean Coast of Turkey. 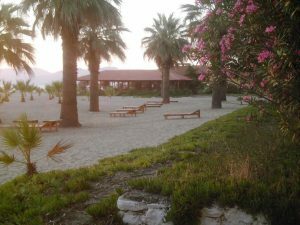 It is 7 km west of Selçuk and 4 km west of Ephesus.Beach is open to the public.It is one of the most unpopulated of its sorts in the local area. Romantics take note: You will see one of the most beautiful sunsets ever. There is a great Waterpark for a great fun. Its known as biggest in Europe. You can easily get a taxi or a dolmus to Pamucak Beach from Selcuk Bus Station. Yoncaköy is a seaside village with luxury villas and has a nice beach area where you can snorkel. You can take a minibus from Selcuk Bus Station. 15 min. drive. Another great beach which is a 15 min. minibus ride from Selcuk is Tusan beach. A resort beach open to the public with cyrstal clear water. Gumuldur has excellent tourist facilities beautiful beaches, restaurants and hotels. Near Ahmetbeyli (Claros) to the east, stands the Apollo Temple and the remains of the colossal statue of Apollo. 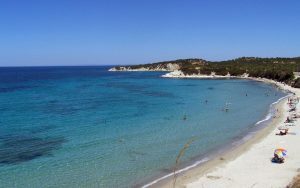 Here you can also enjoy a good fish dinner or a swim at the town’s wide beach. A winding panoramic coastal road leads from Ahmetbeyli south to Pamucak beach. National Park (Milli Park) where natural beauty abounds. The wildlife is given priority over humans here where the park has to be emptied by 8 pm. As well as the flora and fauna the wildlife is exceptional with wild bear coming down from the mountain to wander amongst the tourists. You can choose to walk through the park, drive, trek, cycle, whatever takes your fancy. 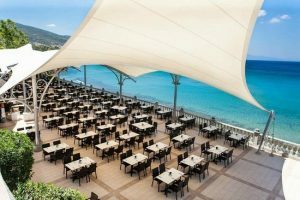 You can take a minibus to Kusadasi and change to Milli Park buses at the same station. It takes about 45 min. drive from Selcuk.